Product information "AKCP RFID Swing Handle Cabinet Lock"
An RFID proximity card swing handle cabinet lock will secure both front and rear doors of your cabinet. Designed with a universal fit, it can be attached to most industry standard cabinets. Manage access privileges, schedules, generate reports and receive alerts through AKCess Pro Server management software. Access decisions are made locally at the swing handle. Many cabinets have removable side panels. Protect and monitor these by adding an optional 4x security sensors and be alerted when side access panels are removed. Use cameras integrated with AKCess Pro Server to monitor your cabinet and synch access events together with video to verify who accessed and when. 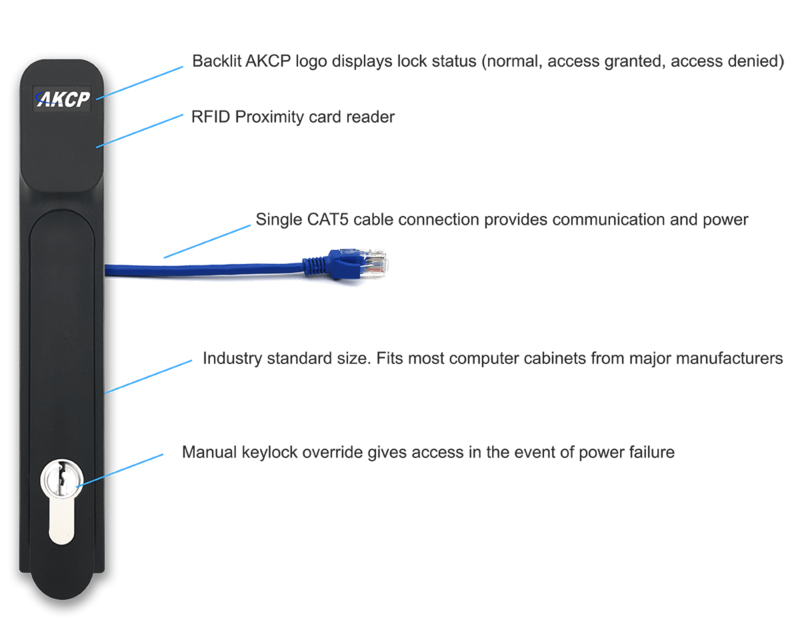 Related links to "AKCP RFID Swing Handle Cabinet Lock"
When plugging the first time or after upgrading a sensorProbe+ unit, the sensor’s firmware might be upgraded by the unit and not be available right away. Customer evaluation for "AKCP RFID Swing Handle Cabinet Lock"